We’ve all heard the term: Last year, ‘post-truth’ was selected by Oxford Dictionaries as their Word of the Year. But isn’t truth specifically the provenance of philosophers? Have we philosophers outlived our relevance? 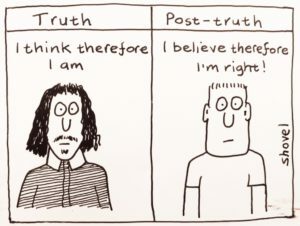 Tonight, professors Reinhard Muskens and Filip Buekens, and master’s student Mike Cotterell will each present their views on this post of truth, and debate each other’s positions – Because even if truth has been scrapped, we can still debate it. And if not, there’s always drink and merriment!